Ms. Nadia Bergamini (Bioversity International) gave a presentation on the development and field testing of the indicators. She explained that the indicators help to measure a community’s capacity to adapt to change while maintaining biodiversity. She then shared the results of the testing in Cuba, Kenya, Bolivia and Nepal and emphasized the usefulness of the indicators for establishing a common understanding at the community level of threats and for determining strategies to strengthen resilience. Looking forward, she underscored the importance of testing the indicators in a wider range of SEPLS including pastures, wetlands and coastal areas. The second presentation was delivered by Ms. Diana Salvemini (UNDP), who described how the indicators are being used in COMDEKS sites to help measure and understand the resilience of the target landscapes and to identify necessary activities to strengthen resilience. She highlighted the usefulness of the indicators as a tool to promote a participatory process, and the importance of having a facilitator who is familiar with the community and can provide explanations in clear language tailored to local conditions. Looking forward, she emphasized the need for further improvements to the scoring system and strengthening of the social indicators. 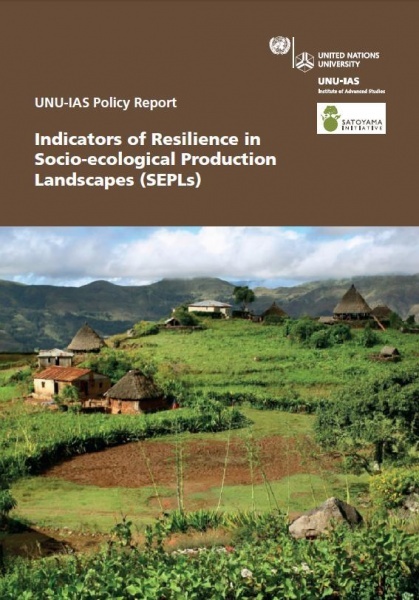 The seminar also marked the launch of the latest UNU-IAS Policy Report on “Developing Indicators of Resilience in Socio-ecological Production Landscapes”. The public symposium titled “New Commons: Governing Satoyama-Satoumi Landscapes for Human Well-being” was held on March 21, 2013, in Kanazawa, Japan. Researchers, professors and international experts whose research focuses on satoyama-satoumi, together with local stakeholders from the Wajima Chamber of Commerce, Kanazawa Agriculture and Ishikawa Prefectural Government, made presentations to help find innovative pathways towards sustainable use and management of landscapes. Mr. Kazu Takemoto (Director, UNU-IAS OUIK) welcomed the local and international experts to the symposium, described the collaboration efforts with Ishikawa Prefecture towards serious challenges ahead and opportunities for satoyama and satoumi landscapes, and expressed his hope that the symposium would help find innovative pathways towards sustainable use and management of these landscapes. well-being, including the importance of providing habitats were extensively discussed. The second keynote speaker, Prof. Koji Nakamura (Kanazawa University) introduced the results of the Japan Satoyama Satoumi Assessment and the plan for comprehensive assessment of satoyama/satoumi and human well-being in Ishikawa. In line with this, a 3-day design workshop was convened on March 19-21 to design a biodiversity and ecosystem services assessment in Ishikawa Prefecture with focus on the Noto Region. The third keynote speaker, Prof. Anantha Kumar Duraiappah (United Nations University International Human Dimensions Programme on Global Environmental Change) explained the concept of a new commons, which he defined as the spatial boundary that contains different ecosystem types that together produce a minimum set of regulating services (water, soil-nutrient recycling, flood protection, etc) to produce the bundle of provisioning services (rice, vegetables, etc). He emphasized the “new commons” as a key to the success of a more integrated and holistic approach of ecosystem management. Three short presentations were delivered by local stakeholders, Mr. Yoshinari Ohtsumi (Wajima Chamber of Commerce / Ohtsumi Marine Products), Mr. Shinjiro Imura (Kanazawa Agriculture / Kanazawa Daichi Co. Ltd. / Asian Agriculture) and Mr. Taisuke Watanabe (Ishikawa Prefectural Government) regarding their activities and experiences that contribute to the revitalization of satoyama/satoumi in the Noto area. Specific experiences shared included the conversion of abandoned land into productive farmland planted with rice and vegetables using organic farming methods, the Satoyama Creation Fund, environment friendly initiatives like the Noto Smart Drive project, and others. Yokohama National University (YNU) organized a public symposium entitled “Reconstruction and Invigoration of Disaster-hit Areas – Viewpoints from Rikuzentakata” at the YNU Education and Culture Hall on 25 March 2013. 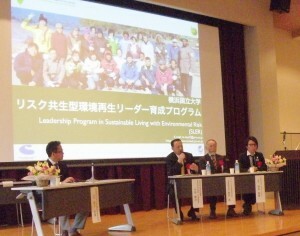 During the symposium, speakers reported on field visits to Rikuzentakata City in Iwate Prefecture and various activities conducted during the visits organized by the Leadership Program in Sustainable Living With Environmental Risk of YNU, and discussed about challenges that disaster-hit communities are facing as well as their future perspectives with local representatives playing a leading role in their communities. In early April, representatives of several IPSI member organizations (ANDES, Bioversity International, IUCN, UNEP-WCMC, UNU) joined other specialists at a workshop to discuss resilience and connectivity of landscapes and seascapes with particular focus on IUCN Category V protected areas. A book-length manuscript building on these discussions is planned, and past publications by the specialist group can be downloaded here. Tohoku University and UNU-IAS, in collaboration with other IPSI members including the Ministry of the Environment of Japan and CEPA Japan and with support of Yamagata University, co-organised the Second Community-Dialogue Seminar for the Urato Islands, Miyagi Prefecture on 14 April 2013. More than 80 people, including about 40 people from the islands and a wide range of stakeholders participated in the event. Building on the First Community-Dialogue Seminar held in August 2012, which mostly focused on the recovery from the earthquake and tsunami in March 2011, the focus of small-group discussion during the workshop was more on how to move forward to revitalize their communities in a sustainable and comfortable manner through multi-stakeholder collaboration. Reports of this seminar (in English and Japanese) will be available shortly on the Satoyama Initiative website.